If it is working properly and tension is perfect, you won’t notice your bobbin thread. Don’t let that fool you. Bobbin thread still plays an important role in successful machine embroidery. Bobbin thread is often ignored when troubleshooting embroidery problems. Since it does not go through a needle, there are fewer problems with bobbin threads than with top threads. Still, there are several things you should know. For home sewers and embroiderers, bobbins come in three basic types: Class 15, L-style, and M-style. The type you use depends on the machine you have. Most home machines use L-style while many longarm machines use the larger M-style. Your owner’s manual should tell you the type of bobbin you need. If not, Superior Threads has a wonderful list of bobbin types for dozens of machine brands and models. You can wind most any thread for use in the bobbin. 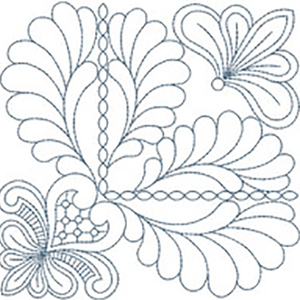 That is standard procedure when stitching freestanding applique or freestanding lace designs. As far as standard bobbins are concerned, there are two basic thread types: Cotton and polyester. Quilters love it. It keeps the fiber content consistent with the fabric, batting, and top thread. For light embroidery designs, cotton bobbin thread is okay but dense fill designs get quite stiff. Always choose a good quality bobbin thread. Lower quality cottons produce more lint which, in turn, requires more frequent machine cleaning. This thread has a shiny appearance and is virtually lint free. It is thin and lightweight, yet very strong. Embroiderers love this thread since it creates a soft backing, even on dense designs. Many machine quilters like using a polyester thread in the bobbin. Smooth, poly thread does not snag or grab the top thread. It works well with metallic threads and heavy cotton threads. If you’ve had trouble using metallics or heavy cotton threads, a slick poly thread in the bobbin may solve some problems. Sewers wind 50 wt. thread on their bobbin. For machine embroidery and quilting, most bobbin threads are of the 60 wt. variety. You may even use 100 wt. when stitching delicate heirloom projects. Early on, many machine manufacturers warned against using pre-wound bobbins. Now, they are available for most makes and models and many staff educators use them. Plastic bobbins are reusable, cardboard bobbins are disposable, and some bobbin threads are wound without holders. Pre-wound bobbins save time, making them very convenient. If you run out in the middle of an embroidery design or a quilting or sewing project, just pop a pre-wound bobbin in the machine. Having to wind a new bobbin is always an inconvenience. Perhaps even better, pre-wound bobbins are more economical. High-tech machines provide a smooth, uniform wind. As a result, pre-wound bobbins hold three times the amount of thread as a bobbin that you wind at home. Next Next post: 8 Ways to Make it Merry!